What Deerfield might have looked like just before the 1704 raid. Illustration by Will Sillin. Old Deerfield Village Historic Landmark District Fertile fields cultivated by Wôbanaki Pocumtuck and their ancestors from time immemorial are bounded by the Deerfield (originally Pocumtuck) River to the west and the Pocumtuck ridge to the east which figures prominently in Native Deeptime stories and which was the location of an important Native homesite, the Pocumtuck Fort. 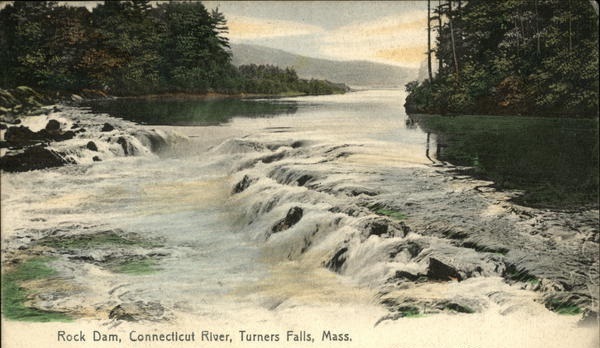 The landscape and its history connect us viscerally to the differing beliefs over land that drove disputes between indigenous peoples and European colonists. The 5,000 acres of the original land grant of the General Court of the Massachusetts Bay Colony to a group of English proprietors in Dedham, MA, was superimposed on Pocumtuck homelands. The Deerfield Landmark District still bears the recognizable imprint of the original 17th c. common field system introduced by the first English settlers of which a partial map of 1671 still survives. The steep incline in the village center underscores the strategic location of the first English fortified settlement planted upon a pre-existing Pocumtuck village site. The wooded slopes of the Pocumtuck ridge offer visual reminders of its importance for woodlots and fresh water for its inhabitants, past and present. Within the Landmark District are restored colonial houses and exhibit spaces. 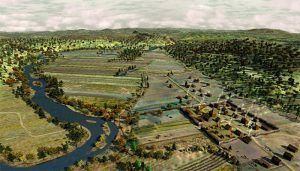 Access to excavations of Native and European archaeological sites in this region, including the Pocumtuck Fort under excavation on the hill above the village of Deerfield, provide tangible evidence of international alliances and trade as well as conflict among Native peoples and Europeans. Staff and scholar-led walks throughout the workshop connect teachers first-hand with workshop themes as they traverse this contested landscape and are immersed in an historically evocative setting. Mount Sugarloaf A trip to Mount Sugarloaf will help NEH summer scholars to situate themselves geographically and chronologically. At this elevation (1,000 feet), one can identify physical features while imaginatively populating the landscape as it appeared at the turn of the 18th century. Looking down the valley one can picture small English settlements nestled by the river on the ancestral Wôbanaki (Abenaki) homelands, supported by some of the most fertile soil in the world. The view to the north includes the site of the Pocumtuck Fort where a generation of Pocumtuck people planted, fished and gathered, and where they processed metal and other trade goods acquired from European newcomers–Dutch, English and French. 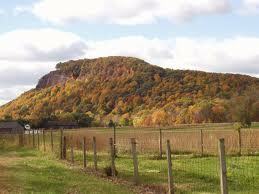 Mount Sugarloaf, or Wequamps, is the central image of the Abenaki Pocumtuck story of the “Amiskwôlowôkoiak” — the people of the beaver-tail hill. Taking advantage of this opportunity to model experiential, site-based learning, we will explore this “deep-time story” as example of the ways in which Native stories in this genre describe in metaphorical terms how ancient geological events reshaped the landscape, forming mountains, rivers, lakes, islands and rocky outcroppings. We will also discuss how Native oral narratives about the landscape formed part of a larger body of knowledge that enabled Native people to efficiently hunt, fish, gather and plant, make climate predictions, and situate homesites in the best locations. Peskeompskut For generations Peskeompskut was a gathering place where Native people fished at a large falls on the Connecticut River. In 1676, during Metacom’s War, the Natives suffered devastation in a pre-dawn attack on Peskeompskut; with 300 Native elders, women, and children killed. In small groups, teachers will tour this site, traversing the rugged landscape of the ancient Native encampment along a deep ravine on the trail believed to be the original native pathway; teachers will see highlights of the site and what it reveals about life of native people in this time. Fort at No. 4 at Charlestown, New Hampshire. Photograph by Lynne Manring. The Fort at No. 4 Located one hour north of Deerfield, the Fort at No. 4 was one of a line of forts constructed to defend English settlements from attack by the French and their Native American allies in the decades following the raid on Deerfield. The Fort at No. 4 staff will lead a tour focusing on the reconstruction of an early 18th-century fort based on documentary and surviving archaeological evidence, as well as strategies for using historical sites to gain a deeper understanding of the people and events of the colonial period.